American policy-makers and presidential candidates must now make a fateful decision—join Moscow in an alliance against ISIS, or persist in treating the Kremlin as an enemy. The 130 people murdered in Paris on November 13 and the 224 Russians aboard a jetliner on October 31 confront America’s current and would-be policy-makers, Democratic and Republicans alike, with a fateful decision: whether to join Moscow in a military, political, diplomatic, and economic coalition against the Islamic State and other terrorist movements, especially in and around Syria, or to persist in treating “Putin’s Russia” as an enemy and unworthy partner. If the goal is defending US and international security, and human life, there is no alternative to such a coalition. The Islamic State (ISIS, ISIL, or Daesh) and its only “moderately” less extremist fellow jihadists are the most dangerous and malignant threat in the world today, having slaughtered or enslaved an ever-growing number of innocents from the Middle East and Africa to Europe, Russia, and the United States (is Boston forgotten?) and now declared war on the entire West. Today’s international terrorists are no longer mere “nonstate actors.” ISIS alone is an emerging state controlling large territories, formidable fighting forces, an ample budget, and with an organizing ideology, dedicated envoys of terror in more countries than are known, and a demonstrated capacity to recruit new citizens from others. Nor is the immediate threat limited to certain regions of the world. The refugee crisis in Europe, to take a looming example, is eroding the foundations of the European Union and thus of NATO, as is the fear generated by Paris since November 13. This spreading threat cannot be contained, diminished, or, still less, eradicated without Russia. Its long experience as a significantly Muslim country, its advanced military capabilities, its special intelligence and political ties in the Middle East, and its general resources are essential. Having lost more lives to terrorism than any other Western nation in recent years, Russia demands—and it deserves—a leading role in the necessary coalition. If denied that role, Moscow, with its alliance with Iran and China and growing political support elsewhere in the world, will assert it, as demonstrated by Russia’s mounting air war in Syria, whose advanced technology and efficacy against terrorist forces are being under-reported in the US media. France and much of Europe quickly made their decision. Following the tragic events of November 13, French President François Hollande called for “a grand coalition,” specifically including Russia, against the Islamic State. Still more, on November 17, his unprecedented appeal to the European Union—not US-led NATO—to activate its own “mutual assistance” provision was unanimously approved, implicitly endorsing his proposed alliance with Russia. 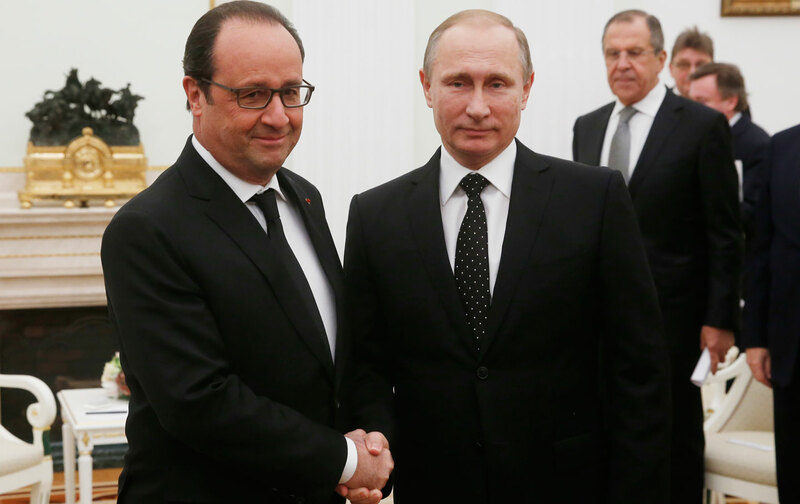 Hollande, rising to lead Europe, then departed to meet with President Obama and Russian President Putin. Our policy elite’s disregard for America’s national security is a result of the new US-Russian Cold War under way at least since the Ukrainian crisis erupted two years ago. We have argued repeatedly that Washington policy-makers bear more than their reasonable share of responsibility for this exceedingly dangerous and unnecessary development. Now is not the time to recapitulate those arguments but instead to rethink political attitudes toward Putin’s “pariah” Russia in order to join Moscow in Hollande’s proposed coalition. There are woefully few signs of such rethinking, even after Paris. Like most of the Republican would-be presidents, Hillary Clinton continues to speak derisively about Putin’s leadership, insisting he “is actually making things somewhat worse.” Inexplicably, unless she wants war with Russia, she also continues to call for an “imposed” no-fly zone over Syria, which would mean attacking Russian war planes flying there daily. Strobe Talbott and John Bolton, each reportedly an aspiring secretary of state in the next Democratic or Republican administration, respectively, agree (uncontested, as usual, in the Times) that Putin’s Russia remains “part of the problem.” Indeed, Paris scarcely diminished the Cold War demonizing of Russia’s president; as Clinton did months ago, a Post editorial and a Journal columnist equated Putin with Hitler. Obama has repeatedly treated Putin in ways unbefitting the White House—and detrimental to US national security. In addition to persistent Putinphobia (and perhaps Russophobia), other ominous factors have been at work since November 13. On November 22, ultra-right Ukrainians destroyed Crimea’s source of electricity, sharply re-escalating conflict between Moscow and Kiev. Two days later, NATO-member Turkey shot down a Russian warplane in still murky circumstances; jihadists waiting below machine-gunned the pilot as his parachute descended over Syria. Whether these two events were coincidence or provocations to prevent a Western rapprochement with Russia, both testify that the new Cold War, which has spread from Ukraine to Europe and now to Syria and Turkey, risks actual war between the two nuclear superpowers. In such perilous circumstances, only the American president can provide decisive leadership. Over the years, Obama has repeatedly treated and spoken of Putin in ways unbefitting the White House—and detrimental to US national security. He did so again after Paris. Putin told Hollande, “We are ready to cooperate with the coalition which is led by the United States.” Obama, however, who endorsed Turkey’s inexplicable shoot-down of the Russian warplane, used his press conference with the French president to again demean Putin and Russia’s contributions: “We’ve got a global coalition organized. Russia is the outlier,” adding condescendingly that Moscow might be permitted to participate, but only on US terms. In times of historic crisis, great leaders often have to transcend their own political biographies, as did FDR and Lyndon Johnson and, 30 years ago, Ronald Reagan and Mikhail Gorbachev. It’s time for President Obama—and every candidate who wants to succeed him—to do so.